we definitely miss Rondo - although I don't think he would have made a difference tonight. He's young so he's gonna be inconsistent. Give him a couple of years and he'll be a pretty good player. Not scoring a single point registering a doughnut is bad but his assists to Lebron and defense were good. We need him to put some points on the board though if we want to win. Kuzma not being himself today hurt us tremendously. We got Beasley and Moe going a little... the loss will be worth it if they start playing well. Also Svi. and Svi's shot starting to drop, there's always positives in a loss, like realizing nba refs are the best in the world and tim donaghey was "fake news"
If we play Svi regularly, he can provide the 3 point threat we lack. He's starting to settle in... made some shots... stopped making dumb passes. It's difficult for young player like Zo, to regain form after an injury that sidelines him for 6 months. But only way to get his edge back is to keep attacking. From the tip they looked lackadaisical and I knew it was a loss even though they got an early lead. This is a group of youngsters and knuckleheads so you know they got a little full of themselves after 4 straight wins. I hope lebron aint too attached to kuz and hart cause we could trade them both now for more value than they will have like, 6 months from now, IMO. BI, to toronto for KL if they think he won't resign. Doesn't look like anyone will take Ball but he will turn out fine but in a few years which is a problem with the window of kinda prime Lebron. He’s actually been pretty consistent. On my NBA channel it’s Utah destroying Boston right now. What channel is Pho vs OKC? Defense seemed lost rotating against ball movement of Orlando. It's like we don't practice defense against same type of offense during our practices. What worries me, is as Javale and Tyson wear down (we're already seeing it with Javale), then we're really in trouble on defense. Nice. I have high expectations for Ayton. I think he has a great chance to be something special. I hope they nationally televise when Ayton goes up against Joel Embiid. Why is our local legend, Lisa Leslie, working for the damn joke Magic?!? Problem is we're in a "competing mode" and not "rebuilding mode". Bad players (vets or rookies) do not get a long leash. We can't tolerate a bad game from Lonzo and keep letting him play. 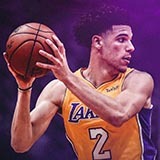 You have been watching Lonzo "attacking", right? I would ENCOURAGE him to attack attack attack the basket like a madman if he could do it. If you've been watching him play, you should know if that would be a good idea or not.